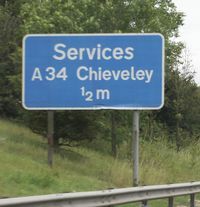 Originally a small offer on the A34 southbound, Chieveley grew to become a full service area at the complex M4 interchange. First two hours free for all vehicles, after which charges apply. There is a long stay car park on the left as you enter, signposted Travelodge. Here cars must pay £16 and HGVs, caravans and motorhomes £30. HGVs can pay £31.50 to include a £10 food voucher. The location code is 2433. The parking in front of the restaurants and shops (on the right as you come in) costs £25 for stays over two hours. The location code is 2482. If you don't see the long stay parking on your way in then you have to leave the services and navigate the roundabout network to make your way back in. There is no way to drive to the long stay parking once you have reached the short stay car park. Prices are paid using PayByPhone - more details. The fees are strictly enforced by CP Plus. Upon opening, some posters called it 'Newbury (Chieveley)'. Most services used local names at the time and Granada appeared to go back to this. There is a DoubleTree by Hilton hotel opposite the services, but it's not part of the Moto site. To avoid confusion, both the Hilton Hotel and Moto's on-site Travelodge are signed as tourist attractions, and when they're in the same direction the legend "hotels" is used. Like most M4 services, Chieveley was discussed on Gavin and Stacey, where Smithy says of it "Chieveley's the best, it's insane". In 2010 the AA pointed out that the fuel at Chieveley cost 7p more than a local garage one mile away. Moto blamed BP for the prices, while BP blamed Moto. There are 229 car parking spaces, 86 HGV spaces and 9 coach spaces. When opened, the building was a small square shape, with a central atrium. The atrium had doors to the two restaurants branching off it. Expansion works added a Costa, West Cornwall Pasty Co. and seating area to the front of the services as part of an extended lobby area. This has become standard. On 23 March 2015, a new trial restaurant called Arlo's Pantry & Kitchen opened here - the first at a Moto service area. The trial was successful and Chieveley's neighbouring Moto sites Reading and Leigh Delamere also gained an Arlo's. 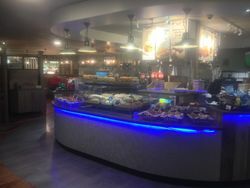 Arlo's is based in the centre of the old atrium, taking attention away from the main Costa unit, whereas EDC's servery had occupied most of the back of the building. For years this non-standard sign was the only one on the M4. The services originally sat on the A34 southbound with a link back to the Chieveley Roundabout, hugging the existing maintenance depot in the corner. It was they technically designed only to accommodate A34 traffic, but the appeal of the location for Granada was that it could serve the M4 too. Upon opening, signs were placed on the M4 as a temporary arrangement until Reading opened. The old loop road isn't needed any more but it was originally still there for works traffic. Further changes saw the works traffic given a new exit, and the loop road closed as a redundant reminder of the old main exit. A farm continues to be accessed from the services.